We have all heard poems set to music as songs...But often something of the cadence, meter, or special emphasis of the original poem is lost in the process... But a spoken poem, when coupled with Don Angle's delightfully innovative approach to harpsichord playing, takes on a new Life. The many different poems - traditional and contemporary - and diverse music, ranging from Classical to Jazz, are woven together so that listeners of all ages will find fresh delight in old favorites as well as highly original presentations of unexpected pieces! ANNE CARTER has enormous enthusiasm for different kinds of poetry. In addition, she brings to this project, her boundless creative energy, a beautifully expressive speaking voice, antic humor and great generosity of Spirit. She has worked as a tutor for dyslexic children, and currently records books for the blind and dyslexic. She has said: "Lyrics of so many songs can be mediocre, but they become popular - thanks to a catchy tune. How much more worthwhile to take a first-rate poem and enhance its mood or meaning with great music!" 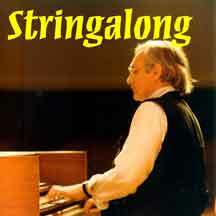 DON ANGLE is an internationally known harpsichordist whose early background as a pop, jazz, and country-western pianist, combined with an extraordinary musical talent and inventive mind, result in a unique repertoire of brilliantly executed arrangements and original works, many of which are available on CD. One of the world's great harpsichord players, Don has chosen to specialize in music not traditionally associated with the harpsichord, to demonstrate the wonderful versatility of this beautiful instrument.